It does sound like something out of The Jetsons, but with a prototype from Amazon, and fierce competition coming from Australia Post, it’s looking like Jeremy Clarkson was right when he referred to drone delivery as “a miracle of modern technology”. It's said to be the future of fast order fulfilment as drones on the road and in the sky are taking over logistics models as a quick and efficient way to safely reduce travel times. Below we cover two successful tales of innovative businesses using pilotless aircrafts to deliver goods straight to the customer. Although it sounds far off in the distant furutre, we really don’t have to imagine a futuristic world filled with flying parcels. In November last year, the first ever pizza was delivered in New Zealand thanks to Domino’s. 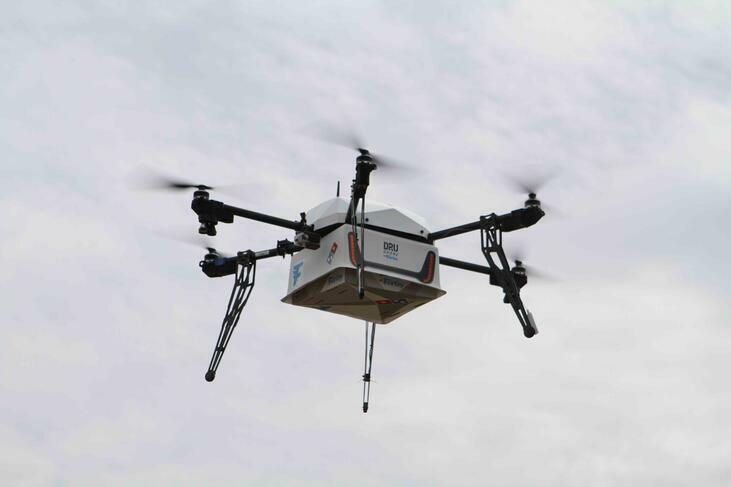 This marked the world’s first commercial delivery of food by drone, and Domino’s CEO, Don Meij has stated that drones will be an essential component of their order fulfilment strategy. There is a lot to learn from Domino’s new delivery strategy that features a $30,000 delivery robot, but one of the best lessons from the pizza company is the pragmatism underlying the new fulfilment strategy. “My view is that our business is going to double in the next five years, so we need more than twice as many drivers because more of the growth’s coming from delivery. When we launch DRU ground and DRU drone, they’re not going to do 100% of deliveries. You can’t get inside buildings and high-rises,” the CEO stated. Domino’s was actively encouraged by NZ authorities to introduce the drones, and although they are not in the position to introduce this in Australia at the moment, the benefits so far have been avoiding traffic congestion and lights while also safely reducing delivery time and distance. It also would go without saying leaving one happy customer after they experience a futuristic way of delivery right to their home. But it’s not just pan-crust pizzas that are humming through the air. Amazon also recently secured an agreement with UK authorities to develop the technology that will deliver goods within 30 minutes of purchase. Read about it below. You may have already heard about the Prime Air from our post on Amazon’s pioneering drone strategy, as they introduced these buzzing robots in an effort to boost delivery capacity. Amazon is still testing their strategy to ensure their fleet meets all the required standards, but their first drone delivery occurred last year and you can watch it here. In the trial that is currently taking place in Cambridge, customers are able to choose from a selected list of items from the online store, which will then be delivered in 30 minutes of purchase. These small buzzing aircrafts can fly up to 10 miles from their operators through special air corridors. Although Domino’s pizza drones are equipped with mini parachutes in case of failure, the Amazon Prime Air is completely autonomous with sense and avoid systems that will help them avoid objects in their path. When fully implemented, the Amazon Prime Air will make two day shipping times seem archaic. And what's more, the market for drone delivery is only set to grow. 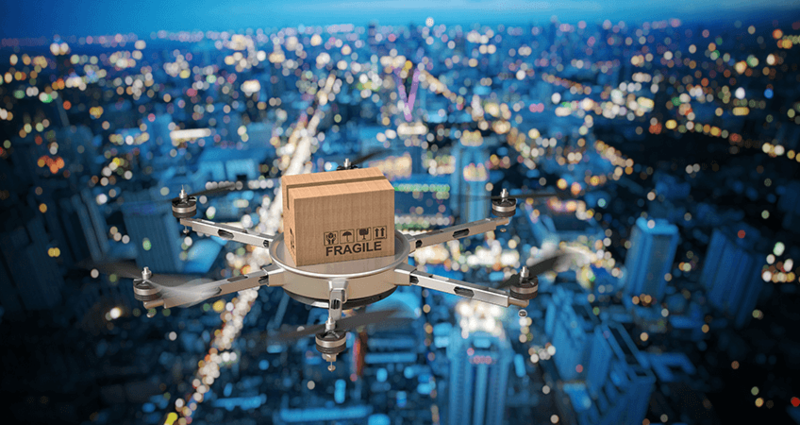 Eventually, drone delivery will be totally anonymous as more and more businesses develop centrally located distribution centres, backed by a brigade of autonomous trucks and pilot-less drones. From the moment the customer submits their order, a series of autonomous triggers will send the items on their merry way to the patiently awaiting buyer. We’re starting with pizza and small purchases online, but as regulation in many countries catch-up, and more innovation in drone technology is introduced, we’ll soon be able to order most things online and have them delivered to our backyard in under an hour. What are your thoughts on these developments in drone technology? Let us know in the comments below.